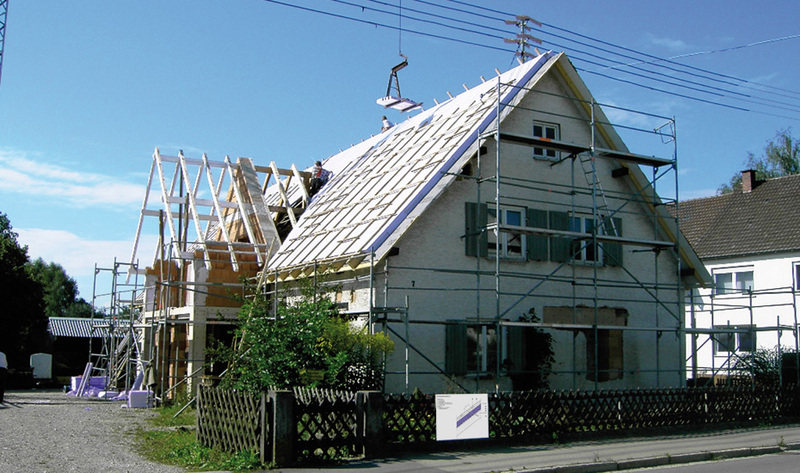 Reliable thermal bridge-free insulation in the pitched roof. Insulation on top creates space underneath. In contrast to thermal insulation between the rafters, with the over-rafter insulation system the insulation boards are laid on formwork over the rafters. This has the advantage that very large thicknesses of insulation can be achieved in this way (over-rafter insulation plus full-fill rafter insulation). The roof structure for this application is usually carried out as follows: Used as over-rafter insulation, the JACKODUR thermal insulation boards fulfil the minimum requirements of DIN 4108-10 DAD. Lay the insulation boards, with a shiplap or tongue-and-groove edge profile, fully over the formwork without gluing in place. Lay the boards in a bond pattern, laying them closely butted on a clean and even substrate. Discontinuities or open joints can be filled with cut-to-size strips of the insulation material or with PU foam as appropriate. JACKODUR® Insulation Strip XPS thermal bridge insulation for roof and interior construction.